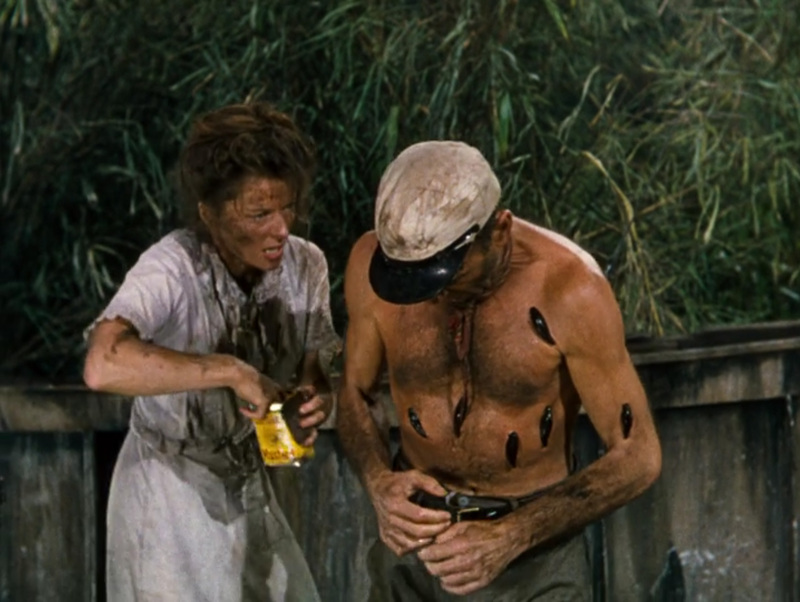 Who doesn’t love Bogart and Hepburn in a filthy boat covered with grime somewhere in Africa? 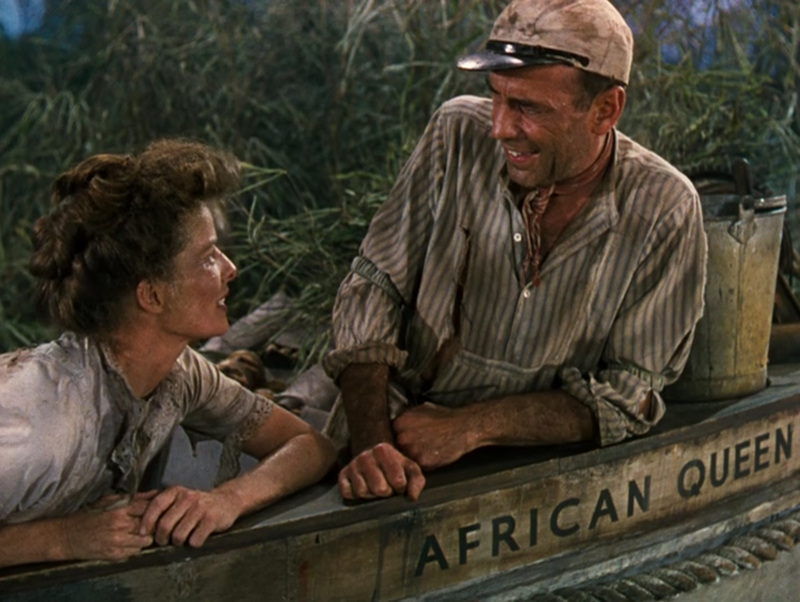 African Queen (1951) directed by John Huston is a classic. I love this movie. It is a wonderful adventure and a wonderful love story, a wonderful study of character and a model of crafting good dialog. It is one of the more famous films to come from Hollywood and most people are familiar with the tale. 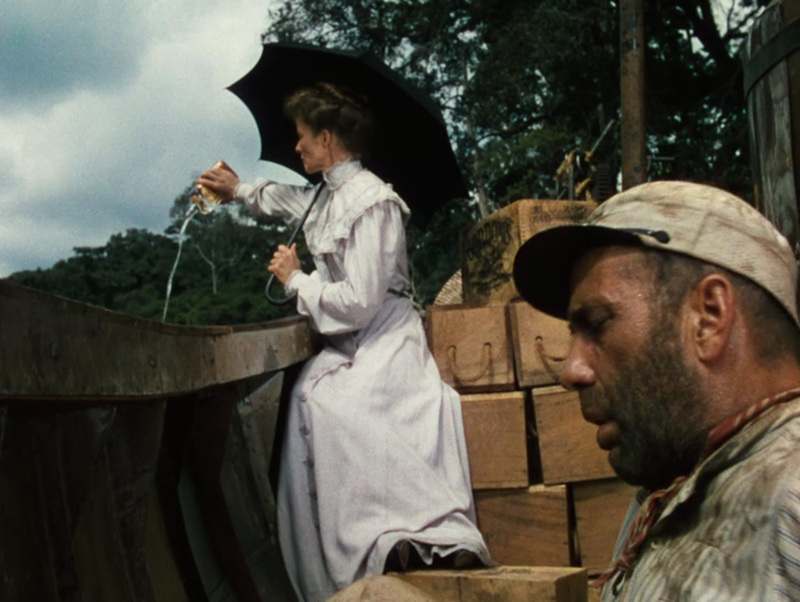 If you, dear reader, have not experienced the pleasure of African Queen, go watch it. Go, do it now. For the rest, I offer my wandering thoughts, the usual opining, and theological rants. There are, as usual, plot spoilers too. I often find that most men ridicule a good romance. Far too many males seem to believe love and dramatic tales of devotion are made for women. I’ve seen dopey guys behave like this in person and online when speaking to each other about movies. There is hooping and hollering about how cool the hero’s apocalypse car is or how tough the champion boxer looks, but when the topic of romantic beauty arises, they laugh and eschew such things as fodder for girls. It is infantile. I think of little boys who squeal with pre-pubescent voices “Eww! Gross!” at the sight of a kiss. How these men are missing out on a world of beauty and happiness! The old tub still has an awning in this shot, and has navigated the first set of rapids on the river. 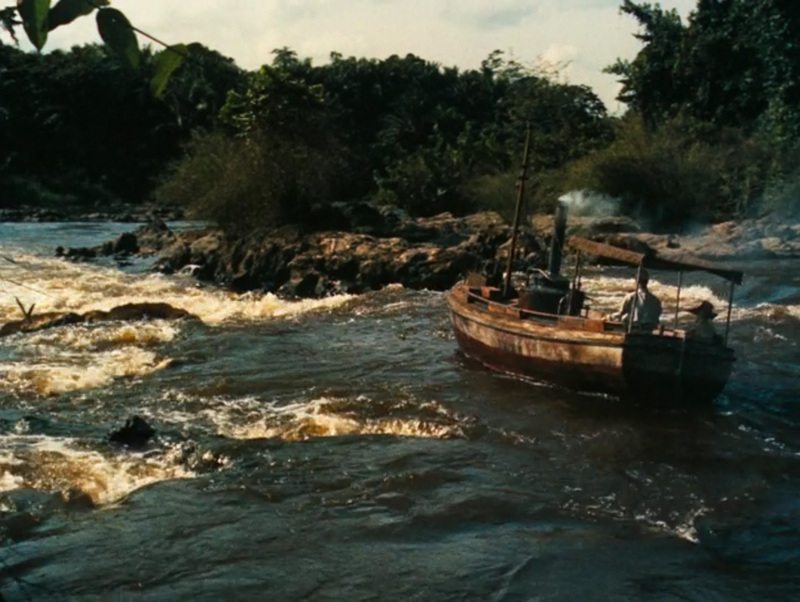 There are very beautiful shots like these that capture the rugged beauty of the Congo. Men ought to be the first to appreciate a tale of love and to delight when a man and woman finding purpose in one another. There is a sublime glory in a marriage that reflects the beauty of Christ himself laying down His life for His bride. If a man cannot appreciate the joy of mutual love between man and woman, and smile with approval at good tales of such affection, he is not fully a man nor could he possibly grasp the wonders of the love of Christ. 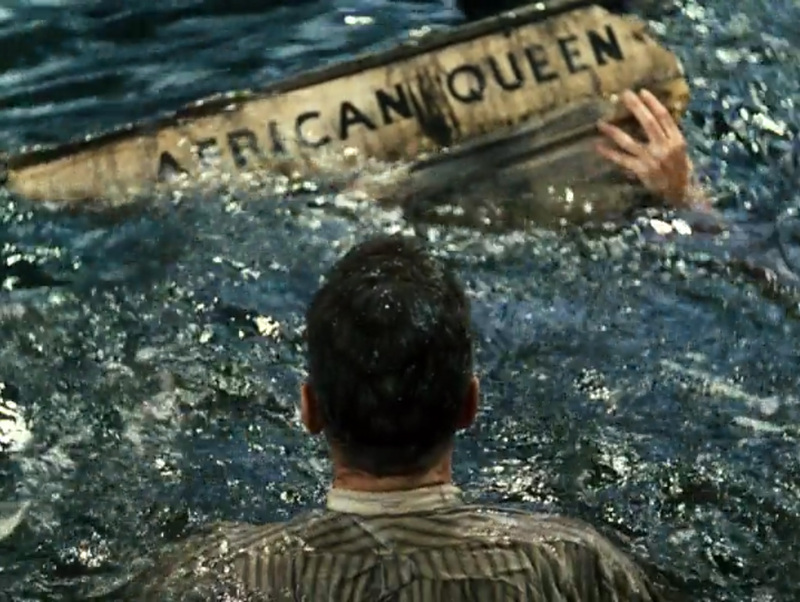 African Queen is one of those wonderful stories of love. But it is so much more as well. 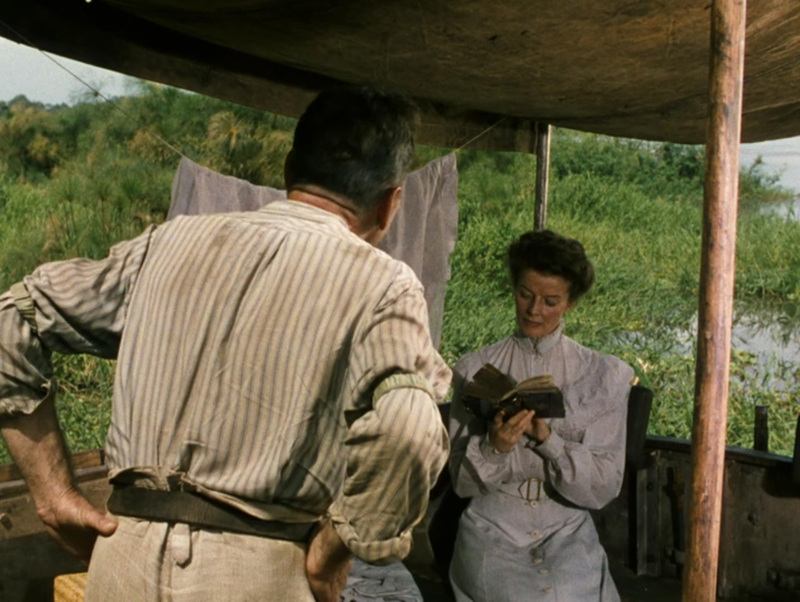 Shot partly on location in the Congo, the film begins with two English Methodist missionaries serving the natives in German East Africa. The year is 1914. When the Great War breaks out, the Sayers, brother Samuel (Robert Morley) and sister Rose (Katherine Hepburn) are now in the uncomfortable position of being enemies of the German state. 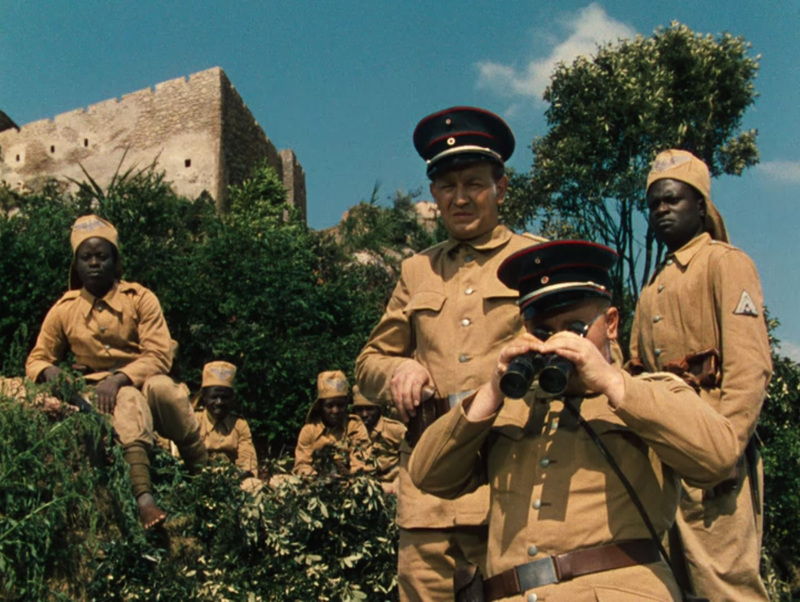 A German squad is sent to destroy their mission and in the process, Rev. Sayer is mortally wounded by a zealous rifle-stroke to the head. The good fellow dies of fever and discouragement days later. Rose Sayer, without her brother to assist, is left to the ruins and an unclear future. The pietism of flawed Christian doctrine at work. Charlie comes off a bender while Rosie empties his gin stash. 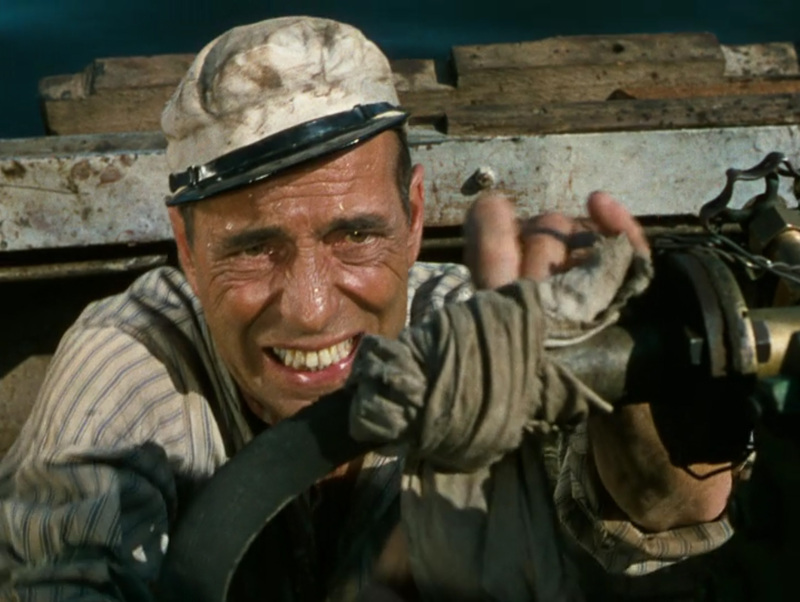 Enter Charlie Allnut (Humphrey Bogart), a gritty and unpolished Canadian import who plies the river carrying mail and supplies in his tiny death-trap of a boat, loving called the “African Queen.” This old boat is a movie icon. It appears to be an old ship’s life boat retrofitted with a salvaged boiler and a surprisingly weak-looking tiller. Its iron hull and canvas awning are a stark contrast to the missionary’s prim and proper church and parsonage. Miss Sayer is quite out of place when Allnut ushers her downriver to safety. 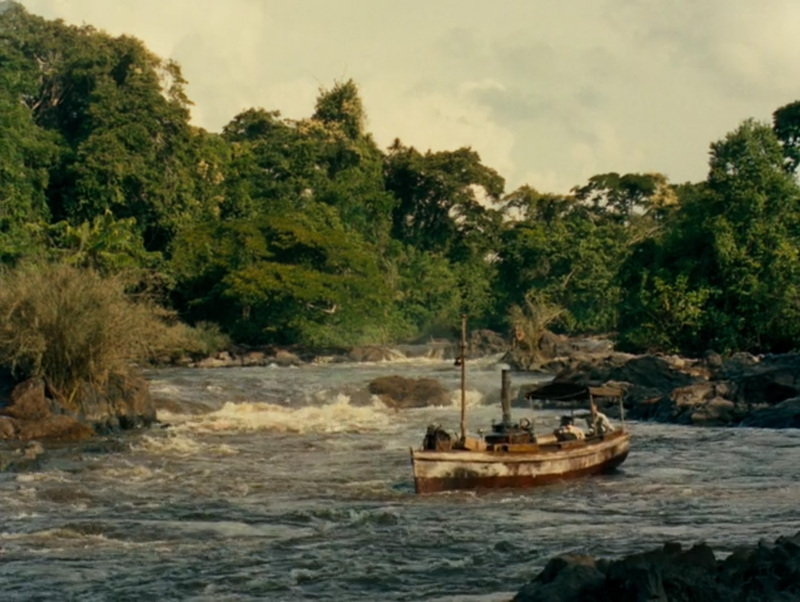 The two could not be more opposite, but along the way, through adventure and danger, over rapids and through German attacks, despite bugs and leeches and mud, they manage to talk themselves into love. Charlie Allnut is a crusty old river man. He’s learned a life of ease and has no time for danger and risk. He’s a lover of gin, much to Rose’s horror. He imbibes a bit much, and his drunken stupor caused quite a rift between the two. It did not help their relationship when Charlie called Rose a “crazy, psalm-singing, skinny old maid.” But beneath river’s dank film which gives Charlie a ripe and grisly presence, there is a man who is virtuous. He shows himself to be devoted, chivalrous and empathetic, traits all men should possess. He’s quite a witty fellow too, and the banter between Charlie and Rose is second to none. We note that as the affection for Rose grows, her name changes. She goes from Miss, to Rosie, to Ol’ Girl in the length of a river. Love blossoms and Charlie finds an unexpected treasure. 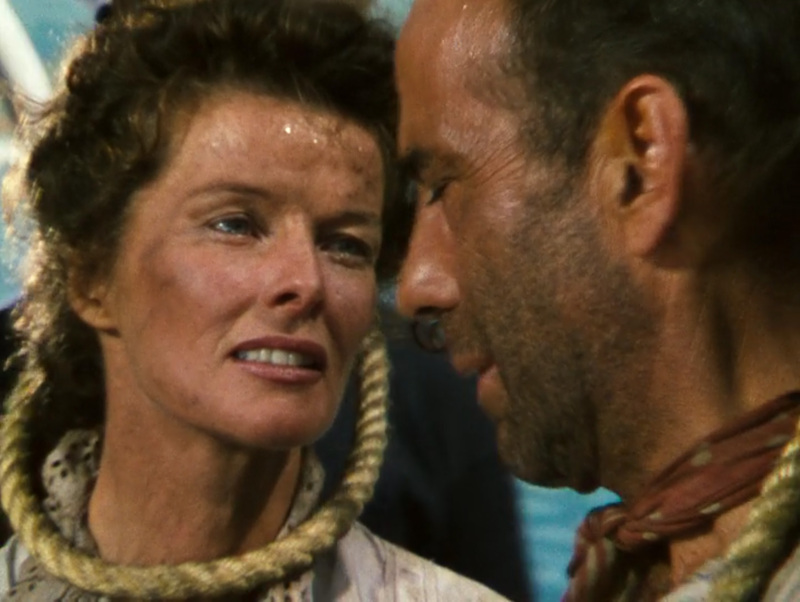 Katherine Hepburn is excellent in her role as a proper Englishwoman. She practices proper etiquette and can serve a proper high tea. She is depicted as a teetotalling Methodist. This is, in a historical sense, an accurate detail. It was in the 19th century that many churches were persuaded by poor doctrine that alcohol and drinking of any sort was a terrible sin and a character flaw. Indeed, it was a Methodist man, Thomas B. Welch, who developed a process for pasteurizing grape juice to keep it from fermenting. He did this specifically for communion, and thus many evangelical, mainline and fundamentalist denominations abandoned the clear teaching of their own Bible and substituted grape juice for wine. This offense at any drinking at all is still present today in many Christian circles, but Rosie certainly played up the role of teetotaler quite well. After Charlie’s bender, she emptied all of his gin into the river. This is Rosie’s only character flaw, and most wouldn’t recognize it as such, but would see it as Christian-like behavior, maybe a quaint and antiquated snobbery even. In historic Christianity, for what its worth, drinking alcohol is viewed as a blessing, the “spirits” in the wine remind the communicant of the presence of the Holy Spirit, and the Bible indicates the heart is made merry by wine. Jesus Himself initiated his earthly ministry by providing excellent quality wine to a wedding party, so if alcohol is sin, Jesus sinned. The Bible only condemns drunkenness, just as it condemns gluttony and all other forms of over-indulgence. Charlie Allnut was dead drunk. The enemy and his conscripts prepare to open fire. No more about theology. Rosie always pushes Charlie to try a little harder, to do a little better, to push himself to prevail over adversity. She is a woman of excellent character aside from her misplaced teetotaling pietism. She discovers that the gritty Mr. Allnut has an adventurous charm and is a good man under the layer of beard stubble and filth. She helps to bring out his good side and is always promoting his success. Adding to her qualities of good character, she discovers a sense of elation from risk and adventure as they traverse the rapids and face dangers. It was Rosie’s idea to craft torpedoes out of welding tanks and to risk passing by a hostile German fort along the river. It is evident that she was a tough ol’ gal, as Charlie would say, since she had 10 years experience in the un-air-conditioned tropics as a missionary. The implication is clear that it was Ms. Sayer who was the strength behind her stuffy but well-meaning brother, Rev. Samuel Sayer. When her brother died, it was as if Rosie’s purpose was lost. When Charlie came along, it was only a matter of time before Charlie would have a beloved partner in love and life. She is delightful example of a Christian woman – strong, encouraging, brave, yet recognizing gender roles as God designed them and being the strength behind her man. 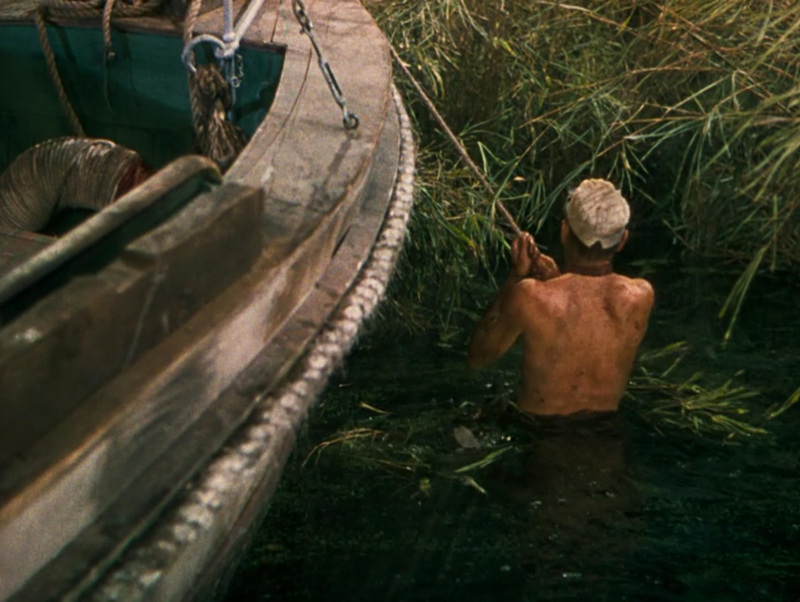 When Charlie and Rosie manage to escape the river delta reeds and float free of the vegetation, they hatch a plot to sink the German patrol boat that plies the lake before them. Unfortunately, they are unsuccessful, being captured and found guilty. Condemned to die by hanging, the two are granted their last request and are married right before the hanging is to begin. The end is and explosive twist that leaves the viewer smiling. 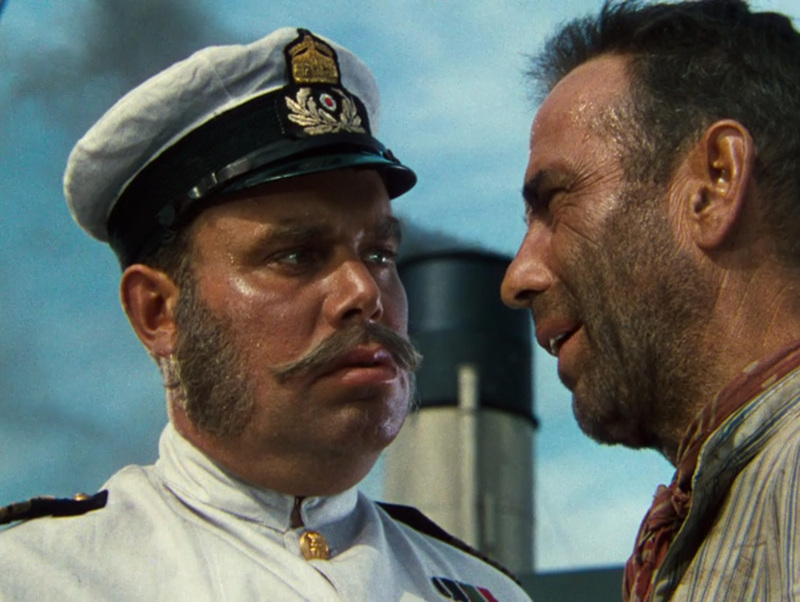 There are some campy situations in the film that are endearing rather than off-putting. The production value is par for the day with lots of obvious miniatures and blue-screening, imperfect superimposed plates, and stock footage of wildlife. 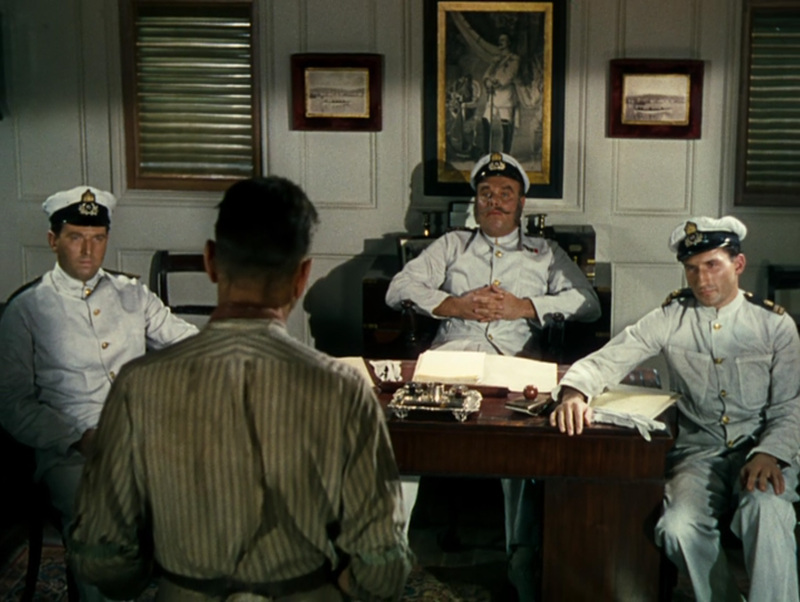 But these do not detract from the film’s charm. Its a real classic that stands the test of time because of dialog and a timeless concern of all men and women, romance. This is a great film for the whole family, it will keep young boys and girls interested and satisfy all. 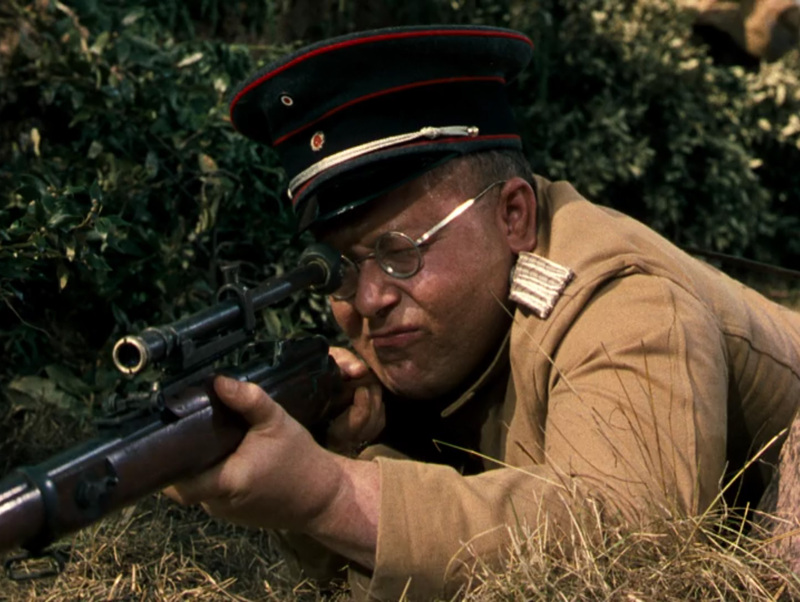 This fella reminds me of Benny Hill. And this fellow reminds me of the walrus in the Disney short “The Walrus and the Carpenter” which appears together with the feature “Alice in Wonderland.” Its the mustache, surely. Happy to be hanged together. The ol’d tub pulled through. 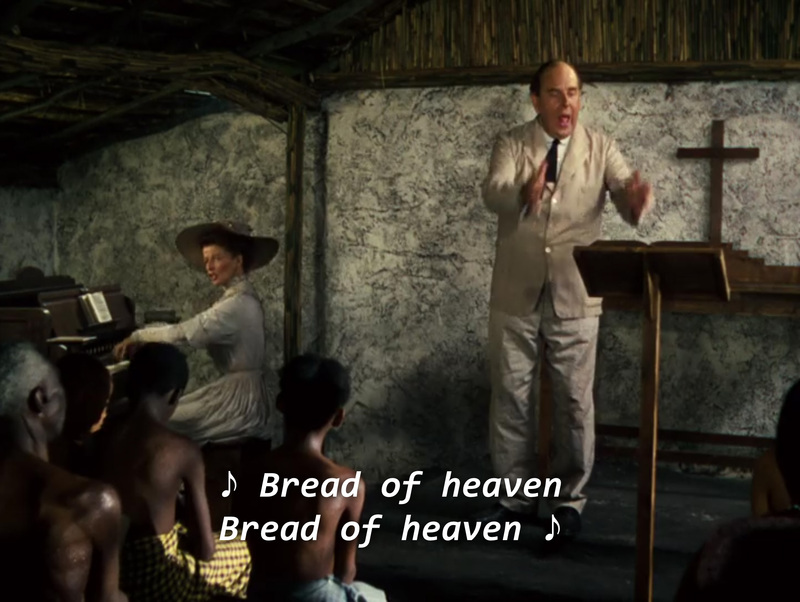 The poor natives never could understand the hymns. What a racket! Before the court of the Louisa’s crew.